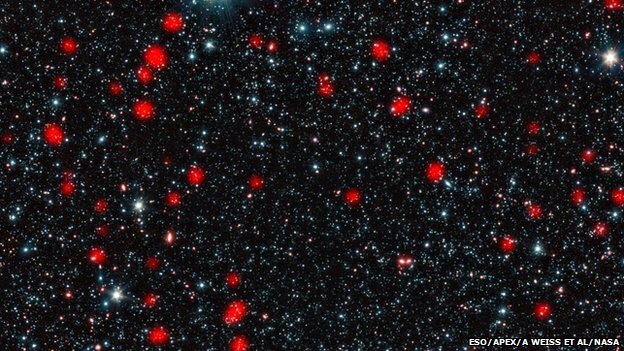 A new research suggests that frenetic star-forming activity in the early Universe is linked to the most massive galaxies in today’s cosmos. This “starbursting” activity when the Universe was just a few billion years old appears to have been clamped off by the growth of super massive black holes. An international team gathered hints of the mysterious “dark matter” in early galaxies to confirm the link. The findings appear in Monthly Notices of the Royal Astronomical Society. Being able to see objects at great distances in the cosmos allows astronomers to look into the past, at light that departed when the Universe was young. Using the 12-metre Atacama Pathfinder Experiment telescope in Chile, an international team led by Ryan Hickox of Dartmouth College studied the way distant galaxies from the early Universe grouped together. Galaxies are understood to be surrounded by “haloes” of a mysterious material called dark matter, which clearly exerts a force but has never been detected. The team’s experiments measured the effects of this gravitational force on the galaxy clusters. With these measured dark matter haloes, and the help of a computer model that describes how the galaxies and their haloes should evolve, the team showed that the frenetic “starbursting” galaxies develop into the enormous elliptical galaxies we see more nearby. “This is the first time that we’ve been able to show this clear link between the most energetic starbursting galaxies in the early Universe, and the most massive galaxies in the present day,” said Dr. Ryan Hickox. However, these bouts of star formation appear to only last about 100 million years, seeming to come to an abrupt halt. The team’s new work adds weight to the idea that the starburst feeds material into the super massive black holes at their centers. These in turn emit powerful blasts of energy as they consume the stars, blowing away the very clouds of gas that could otherwise have coalesced into even more stars.